Sincere effort, and skilled execution are at the forefront of what they do, with master craftsmen and women who are truly artisans of their trade. 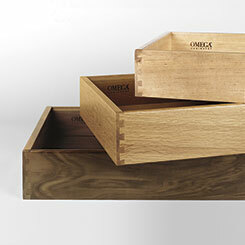 Omega builds beautiful, quality cabinets day in and day out, with the intention that you’ll love your finished product and enjoy the everyday excellence of Omega. They build cabinetry on the order of fine furniture. Expect dovetailed joints on drawers, drawer glides that move quickly and smoothly, and gently close with a push of a fingertip. Painstaking care with an eye for detail is evident in everything they do. 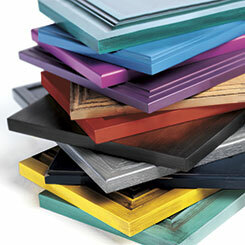 Omega values the folks that build their products, and you’ll appreciate the conscious effort applied to every project. Taking your vision and turning it into reality is what the Pinnacle Series does best. Whether creating a door, sourcing a specie or fine-tuning a finish, the Pinnacle Series from Omega is your authority for artisan craftsmanship built to exacting specifications. Pinnacle features over 128 modifications plus custom quoting for your perfect project. Enjoy the luxurious beauty of natural-finish specie matched drawers and roll out trays in the Pinnacle Series. You’ll also find an array of storage accessories, perfectly matched to your chosen wood type, only available with Pinnacle. 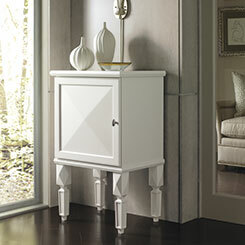 Painted Maple products feature natural maple drawers, roll trays, and accessories. Want something that is yours alone? Bring your ideas to the Timberline Kitchen Design Team for the best in custom cabinet design that boldly makes your statement. Have a favorite artifact that you’d like to match? Or maybe you’d like to follow the latest trend. Pinnacle prides itself on conjuring your color by matching your supplied swatch and sending you a sample for approval.